A putsch in Athens to save allied Greece from enemy Russia is in preparation by the US and Germany, with backing from the non-taxpayers of Greece -- the Greek oligarchs, Anglo-Greek ship owners, and the Greek Church. At the highest and lowest level of Greek government, and from Thessaloniki to Milvorni, all Greeks understand what is happening. Sunday they voted overwhelmingly to resist. According to a high political figure in Athens, a 40-year veteran, "what is actually happening is a slow process of regime change." Until Sunday afternoon it was a close-run thing. The Yes and No votes were equally balanced, and the margin between them razor thin. At the start of the morning, Rupert Murdoch's London Times claimed "Greek security forces have drawn up a secret plan to deploy the army alongside special riot police to contain possible civil unrest after today's referendum on the country's future in Europe. Codenamed Nemesis, it makes provision for troops to patrol large cities if there is widespread and prolonged public disorder. Details of the plan emerged as polls showed the 'yes' and 'no' camps neck and neck." Greek officers don't speak to the Murdoch press; British and US government agents do. "It was neck to neck until 3 pm," reports the political veteran in Athens, "then the young started voting. " Can the outcome -- the 61% to 39% referendum vote, with a 22% margin for "NO" which the New York Times calls "shocking" and a "victory [that] settled little" -- defeat Operation Nemesis? Will the new Axis -- the Americans and the Germans -- attack again, as the Germans did after the first Greek "NO" of October 28, 1940, defeated the Italian invasion? The Kremlin understands too. So when the State Department's Victoria Nuland (see Nudelman; lead image, right) visited Athens to issue an ultimatum against breaking the anti-Russian sanctions regime, and the Anglo-American think-tanks followed with warnings the Russian Navy is about to sail into Piraeus, the object of the game has been clear. The line for Operation Nemesis has been that Greece must be saved, not from itself or from its creditors, but from the enemy in Moscow. The Russian line has been to do nothing to give credence to that propaganda; to wait and to watch. As the head of State's Bureau of European and Eurasian affairs, Nuland is the official in charge of war making in Europe. Her record in the Ukraine has been documented here . Almost unnoticed, she was in Athens on March 17 to deliver two ultimatums. The communique released by the US Embassy in Athens was headlined, "we want to see prosperity and growth in Greece." What Nuland was doing with her hands is in the small print of the release. She told Greek Prime Minister Alexis Tsipras not to break ranks with the NATO allies against Russia. "Because of the increasing rounds of aggression in eastern Ukraine" she reportedly said the US is "very gratified that we've had solidarity between the EU and the U.S., and that Greece has played its role in helping to build consensus." Nuland also warned Tsipras not to default on its debts to Germany, the European Central Bank, and the International Monetary Fund (IMF). Tsipras was told "to make a good deal with the institutions". 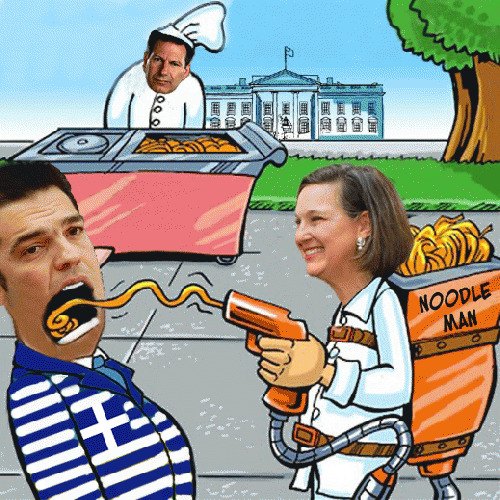 The referendum Tsipras called on June 27 was a surprise for Nuland. The nemesis in Operation Nemesis is the retribution planned for that display of Greek hubris. Having thundered for a year on the illegitimacy of the March 2014 referendum in Crimea, saying yes to accession to Russia, the State Department ignored the Greek referendum for forty-eight hours. On June 29, asked what the US government was thinking of doing if the outcome "is a no vote", Nuland's spokesman, Mark Toner, said the US would ignore it. "We're focused on, frankly, the opposite, which is finding a path forward that allows Greece to continue to make reforms, return to growth, and remain in the Eurozone." The only other official Washington reference to the Greek referendum came on June 30 when the question at the State Department daily briefing was: "what are you doing within the International Monetary Fund, of which the U.S. is the largest shareholder, to try to also press from that side for more leniency with the Greeks?" The official reply : "we're carefully monitoring the situation"we continue to believe that it's important that all sides work together to get back to a path that's going to allow Greece to resume reforms and to return to growth within the Eurozone. But again, we're monitoring this very closely." The last concerted attempt the US government made to overthrow an elected Greek government was against Prime Minister Andreas Papandreou between 1987 and 1989. With his son and successor George Papandreou, there was no such necessity -- George and his mother Margarita Papandreou were already under Washington's control. But against Andreas serious counter-measures were required. Military ones, of the type which ruled Greece between 1967 and 1974, had been unpopular domestically and internationally. They were demonstrably costly; they also discredited the US and NATO military which stood behind the Athens junta. So, the Reagan Administration decided Papandreou had to be overthrown by his own people, if possible at an election. The strategy was "to give Papandreou enough rope to hang himself", said Robert Keeley the US Ambassador to Athens at the time. That too was an Operation Nemesis of sorts -- the plan was for Papandreou's hubris to be defeated in front of the Greek electorate, first in a military showdown in the Aegean with Turkey, then in an allegation of bribery of the prime minister by a Greek banker and football club owner. Both were neutralized in surprise Greek moves US officials had not anticipated. The Turks retreated after a display of combined Greek and Bulgarian force, and the Turkish Prime Minister was medevaced to a Houston, Texas, cardiology clinic. 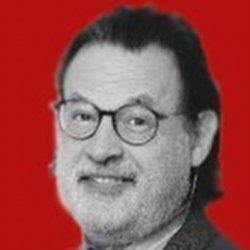 George Koskotas, Papandreou's accuser, was arrested in Boston and returned to a Greek jail. Hubris reversed, you might say. For more, read this . On Sunday, had Greek voters divided evenly down the old Civil War lines, right versus left, blue versus red, the security forces would have been mobilized to confront demonstrators on Maidan, err Syntagma Square, and sharpshooters deployed from the roof of the Grande Bretagne Hotel to kick off Operation Nemesis. To prepare hearts and minds for that, however, the think-tank army has failed almost totally, firing blanks in every direction but Greece. In London the US-funded Legatum Institute skipped the poll evidence and panel discussions, attacking Venezuela, China, Syria and Russia instead for using "phenomena previously associated with democracy--elections, the Internet, the press, the market--to undermine freedoms", along with "the self-organizing potential of society." Legatum left Anne Applebaum by herself to announce the Greek government can be overthrown because it was "elected on a completely false premise".